Find hotel near Piscina Municipal De Algo .. 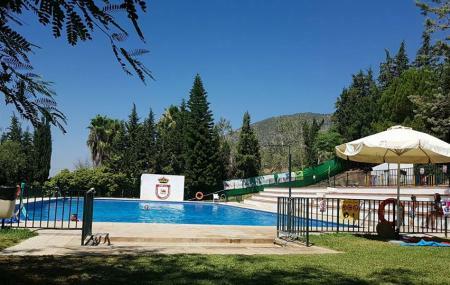 If you get done exploring this little town of Spain and want to unwind in a swimming pool, then the Piscina Municipal De Algodonales is definitely a must visit. A large public swimming pool situated in Cadiz , it is a great place to connect with the locals as well. Put on your swimming trunk and enjoy a fun time for a minimal fare in this public swimming pool. There are also a lot of other attractions to see nearby and you can enjoy a few hours in the swimming pool. Find the joy in planning a D.I.Y. trip by using this awesome Algodonales trip planner. Fine Accommodation options like Casa Rural Coripe, Pensian Coripe, Puerta De La Villa and Hotel Villa De Grazalema will meet your requirement of where to stay in Algodonales. Generate executable plans on your own or book the top rated Algodonales vacation packages for your visit. Read more on how to reach Algodonales. Love this? Explore the entire list of places to visit in Algodonales before you plan your trip. Fancy a good night's sleep after a tiring day? Check out where to stay in Algodonales and book an accommodation of your choice. Speedy service. Good prices for great tapas. Todo muy limpio y cuidado. El bar una maravilla calidad precio. Lugar encantador de pueblo como los de antaño, muy limpio y agradable.